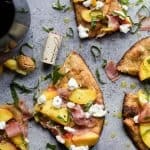 Grilled Flatbread Pizza topped with Peaches, Prosciutto, Goat Cheese, and fresh Basil! The ultimate summer grilling recipe done in just 30 minutes! Place flatbreads on grill. Grill for 2-3 minutes, until there are slight char marks. On the side that is charred, drizzle 2 tablespoons of olive oil. Evenly spread minced garlic, sliced peaches, prosciutto, and goat cheese among the four flatbreads. Place flatbread back on grill. Grill for 4-6 minutes, until cheese is slightly melted or soft and the bottom of the pizza has char marks. Drizzle with remaining 2 tablespoons of olive and sprinkle with fresh basil.